Race promoters Run Nation achieved new ground yesterday to become the first North East promoter to start their 10k race in a shopping centre. The Dalton Park arcade saw 200 athletes make their way through the mall before the centre opened to the public. And it was Sunderland unattached runner Liam Taylor who led the charge into the open to take on the testing 10k course. With a strong wind blowing and a climb to negotiate before completing two laps of a closed road, the conditions were proving difficult. The Springwell athlete led from start to finish to defeat Durham City athlete Matt Hornsby by14 seconds. Tyne Bridge Harrier Mark Toward was third in 37.19. 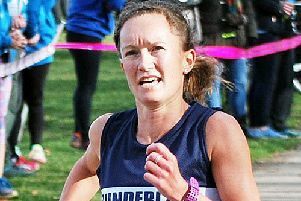 There was a surprise in the women’s race where Seaham athlete Louise Rodgers beat Sunderland Harrier Alice Smith. “I passed Alice just after 5k,” said the Tyne Bridge Harrier, who recorded 41.41. In third place was Claire Harlow of North Shields Poly in 47.29. Results: 1 Liam Taylor (Unatt) 35.08, 2 Mark Hornsby (Durham), 3 Mark Toward (Tyne Bridge Harriers), 37.19, 4 Chris Callan (Elvet Striders) 37.40, 5 Lee Dickens (Sth Shields) 38.17, 6 George Hebdon (Elvet Striders) 38,21, 7 Edna Killgowan (Blaydon) 38.32, 8 Joseph Mulroy (Nth Shields) 38.53, 9 Leigh Towers V45 (Unatt) 39.37, 10 Liam Finnegan (Unatt) 39.50. 5k: Andrew Alderson (Blaydon) 17.37, 2 Will Collinson (Blaydon) 18.30, 3 Darren Clements (Nth Yorks Moors) 20.29.